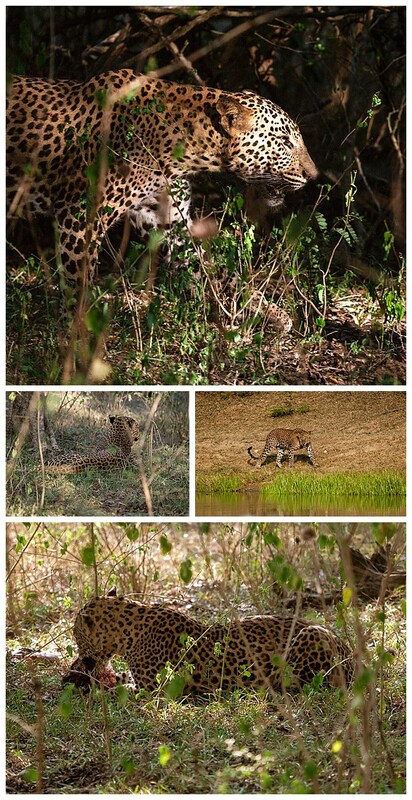 We did a total of two game drives at Yala National Park, famed primarily for the 25 – 30 leopards that live there, which is the highest density in the world. The driver and naturalist guide were quite excited that we saw more than one leopard, as this was unusual. This was another park where there were way too many jeeps all chasing the same scene though, meaning we had to wait in line for more than an hour before it was our turn to view the target leopards. We did spot a leopard on each drive, mostly deep in the brush, out of reach of our cameras. We were even lucky enough to see a leopard make a fresh kill of a small boar. The kill itself was little more than a leap of spots in the brush, followed by a brief flurry of activity out of sight other than a shaking of the underbrush. The leopard could then be seen dragging his new kill to where he chose to eat his meal (bottom). We told our driver that we also wanted to see elephants, after waiting in line for two hours to see a leopard on one of the drives. He laughed, and insisted people only come to this park to see the leopards. We finally convinced him to try, which resulted in the images above. 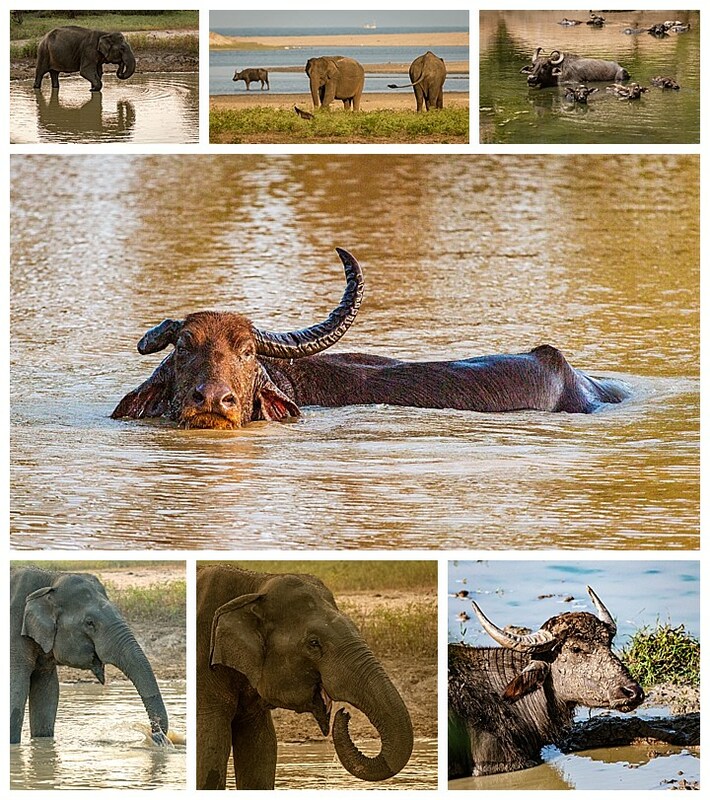 There were water buffalo in the same pond as the elephants, including the one shown center with one missing horn — presumably from some battle it survived. 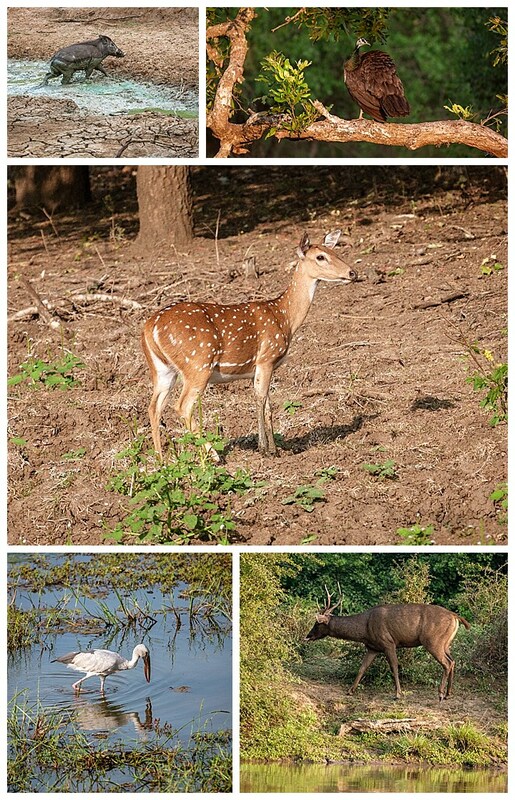 There were also a small smattering of other animals, including a boar similar to the one the leopard was dining on (upper-left), spotted deer (center), and an unusual sighting of an elk (lower-right).